This holiday season, the Momentum Art Guild will display a group show in the Gallery Café at the Freeport Public Library. This exhibition features art works by Ellen Bartels, Carrie Baxter, Phyllis Bergagna, Larita Hawkins, Faye Hughes, Larry McCoy, Nanette Mosher, Mia Rudolph and Phyllis Wendt. Join us on December 10th for a chance to talk with the artists at the opening reception and for a first look at the art works. Carrie will participate in the group booth for the Momentum Art Guild at the 2015 Art in the Park. Carrie will participate in a group exhibition of work by the Momentum Art Guild, in the main lobby of the conservatory. 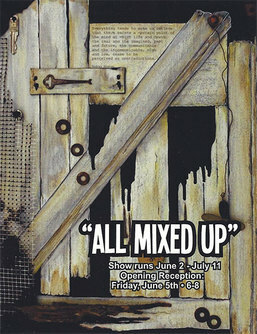 This show runs from June 2nd through July 11th. Do something, do something to that, and then do something to that! Mixed media includes paint, graphite, textiles, sculpture, found objects, etc. Opening Reception: June 5th from 6 to 8 p.m.